One thing that most fans of korean dramas can say is that we come here to ship. We want to get addicted to a couple and squee over and root for them for 16-20 episodes. Sometimes we have our ups and downs with the main pairings, and at some point we’ve all suffered from Second Lead Syndrome. There are countless lists about SLS, but sometimes we still have ships that don’t even qualify for that. Today’s article is for the rare pairs and the crack ships. For exploring fun alternative possibilities. For all the couples that were really never to be, for background romances that didn’t get enough screen time, or for crazy pairing ideas that probably should stay firmly in the realm of crack. I mean c’mon: this is always romantic in kdramas, ALWAYS. 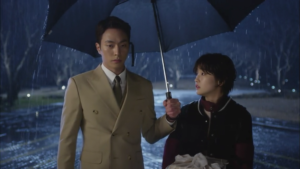 1) My ship was born early in the drama when Lee Yoon Sung does several things first or second male leads typically do for female leads in dramas: cook her dinner, take her clothes shopping, be her confidant, hold an umbrella over her after she gets soaked in the rain. Sure, he only did the first two at rich grandpa’s orders (and the third and fourth out of basic decency). All the same, Korean dramas have conditioned me to read such scenes as romantic things couples always do. Thus they have no one to blame but themselves for me responding to such a scene with a desire to ship. 2) The title references four knights, not three, yet there are only three rich grandsons presented as possible romantic interests. I can only assume that Yoon Sung is meant to be the fourth knight of the title. It’s a bit strange because, shopping trips aside, Yoon Sung is the only one of the four “knights” who doesn’t show any hint of interest in Ha Won. However, he’s still a handsome young guy surrounding Ha Won, so that’s probably why he’s included in the title. Here’s what makes my ship a rarepair and not a crackship: it could really work. I really did like leads Eun Ha Won and Kang Ji Woo together (It’s Jung Il Woo, of course he sells it. Even if he really needs to stop playing this character type. I hope he starts making some career choices that aren’t so safe after he finishes his military duty). But Ha Won and Yoon Sung also make a lot of sense. He’s by her side more than any of the rich grandsons in the first four or five episodes of the drama. He’s her constant confidant, giving her advice and supporting her actions. 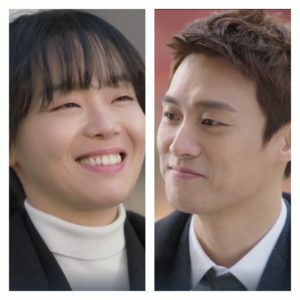 More than any of the others, he seems to listen the most to what she has to say (although Ji Woon does in secret as well, that’s one of the things that sells the romance later). Yoon Sung’s also just really adorable wearing that full suit and a party hat for Ha Won’s not!birthday. Neither are from this glamorous fairy tale world. Even if Yoon Sung understands it better than lead Ji Woon, he’s still not an actual member of the elite, just someone working for them. From the beginning Ha Won rejects the idea of being a Cinderella, so wouldn’t it have been great if, for once, the path to true love doesn’t involve becoming one anyway? I’m not at all advocating that romance should stay within class boundaries. But we’ve seen this Cinderella story so many times that for once it would be a fun twist to not give us what we’re expecting. To watch Ha Won surrounded by all these handsome, rich, lavish men, to be swayed by their charms; but to be, all along, unbeknownst even to her, falling in love with the butler with whom she sneaks quiet moments to get away from it all. That last idea didn’t happen much after the first five or six episodes. Part of me wished it had. Part of me wishes that, for once, we could get that drama. (And if anyone does know of a drama that fits the bill I just described, please hit me up with recs!). I almost made this a two-for-one special because I would change just about every ship in An Innocent Man, also known as Nice Guy, if I had my way. But since my one true burning desire is for Lee Sang Yeob to play the lead in a romance, I’ll stick to his character Park Joon Ha getting a happy ending. Or being noticed at all, for that matter, given that his crush Eun Gi decided he was gay in the first episode and barely registered his feelings until the end. Their friendship was one of the better parts of the story, but it was heart-wrenching to see him stepping back so she could have a toxic relationship with Kang Ma Ru instead. The biggest issue is that I was not made for a show like this one, which on the one hand revels in twisted characters like Kang Ma Ru and Han Jae Hee and the cruel games they play with each other, but on the other drags innocents like Eun Gi into the mud with them and calls it romance. The stubborn and delusional part of me that kept reading Twilight with the hope that Bella would decide she’d rather stay human after all also kept watching An Innocent Man with the hope that Eun Gi would leave Ma Ru to his obsession with his noona (a ship that I could enjoy precisely because both characters in it were dark and vicious) and find herself someone who would treat her right. Someone named Joon Ha, who respected her wishes above all else and never pushed his unrequited feelings onto her nor blamed her for them. Instead he did his best to make sure everyone came out of their messed up situation as unscathed as possible, standing up to the more corrupt characters around him for Eun Gi’s sake all the while. Despite not getting the girl, Joon Ha’s “Love doesn’t mean ownership” line wins the award for most swoon-worthy quote in an otherwise mediocre and unsatisfying drama. If only more characters – and real life people – felt the same. Now THIS is the kind of friends to lovers content kdramaland needs to get on. I got hit with this shipping bug early in the drama. Ho Rang was with a guy who clearly wasn’t good enough for her, I fell for Esom’s Soo Ji in her very first scene, and so I was done in the second Ho Rang started noticing whether or not Soo Ji was wearing a bra. I have pretty low modesty around most of my close friends, but I still don’t tend to notice that kind of thing. Thus Ho Rang doing so was all it took for me, because if we’re all being honest and open here, I don’t take me much prompting at all to ship something. The direction the drama later (and appropriately) took the story involving Soo Ji not wearing a bra sometimes made me feel ashamed for starting a ship for that reason. Of course Ho Rang never creeped on Soo Ji in the same way. They’re proven close friends, only one of whom is with a guy who’s maybe good enough for her. I love the number of close female friendships we get in kdramas, but for once, I’d love to see one that turned into something more. Much like Angela’s love of her Because This is My First Life Ship, my passion for seeing these two lovely ladies together was first ignited by their frustration with men or situations that were beneath them. But my enjoyment of their dynamic grew independently of their solo stories in Age of Youth, also known as Hello My Twenties, and soon I found them to be one of the most layered friendships in the whole drama. With the potential for so much more than friendship, of course. Yi Na and Jin Myung also had a sweet dynamic that I loved, but it was the fire between her and Ye Eun that really ensnared me. Perhaps it’s because they begin as polar opposites that I find them so intriguing, although their opposition stems more from their outlook than their personalities. Because truth be told, they’re both rather similar in some very appealing ways from a shipping perspective. They’re both stubborn as mules, so when they clash the sparks really fly, and they both hide their true feelings beneath a complicated mask. At the same time, their viewpoints on life and morality are so different that it’s all the sweeter when they finally find a middle ground at the end of the first season. This is one of the biggest reasons I’ve held off on watching Age of Youth’s second season, because I’d rather imagine a show in which the two young women ride off into the sunset together than one in which Yi Na is reduced to a “special appearance” and never has an out-and-out brawl with Ye Eun again even as she defends her from anyone else who would look at her friend sideways. I’m probably one of the only people who actually finished this drama. It wasn’t bad, per se, it’s just that nothing ever really happened. One of the only things that kept me going was wanting to see the cute relationship between secondary character Young Shim and her boss come to fruition. Just like everything else in the drama they weren’t spectacular, but there was so little else going on I got really invested into their pairing. I can be hit or miss on relationships involving someone and their boss. Especially when it’s not the main pairing, and thus isn’t explored very much. But Kang Syuk always behaved professionally and respectfully to Young Shim. Plus, he was just such a dork outside of the office, so he and Young Shim felt like they were on a level playing field. At the end of the drama it’s heavily implied that Young Shim and Kang Syuk are together. But we get so little confirmation of it that it’s left me wanting more. *I also lowkey shipped the second male lead with his manager in 20th Century Boy & Girl. It soothed the fleeting SLS symptoms I had. The manager had been with him for over a decade and knew him so well! But then they gave him a last minute love interest via a cameo by the actor’s real-life wife, and that’s just too cute for me to object.